Sybil of Jerusalem, the eldest daughter of Amalric I of Jerusalem and Agnes of Courtenay, was born in 1160. She also had a brother, Baldwin IV, and a half-sister, Isabella I of Jerusalem. Because her parents shared a great-great grandfather, the Church didn’t consider the marriage valid, and so, when Amalric became king, it was annulled. Despite that, their two children were still considered legitimate. Sibylla was raised in a convent by her great-aunt, the Abbess Ioveta of Bethany, where she learned the scriptures and church traditions. When it was discovered that her brother Baldwin had leprosy, the question of Sibyl’s marriage became of paramount importance. Whoever married her, would one day become King of Jerusalem. At first, her father thought of bethroting her to Stephen I of Sancerre, only to change his mind after the young French nobleman’s arrival in Jerusalem. He was sent back home. That same year, 1744, Amalric died and Baldwin became King. He was a minor so Raymond III of Tripoli acted as his regent. After creating Sibyl Countess of Jaffa and Ascalon, they arranged her marriage to William Longsword of Montferrat, a cousin of Louis VII of France and of Frederick Barbarossa. The marriage was short-lived. William died the following year, leaving his wife pregnant with their son Baldwin. Sybil had now lots of suitors asking for her hand in marriage, hoping to inherit the throne of Jerusalem one day. The winner was Guy of Lusignan, whose brother Amalric was constable of Jerusalem. The couple was wed in 1180 and had two daughters, Alice and Maria. Baldwin IV appointed his brother-in-law regent but was soon offended by his behavior in his new role. 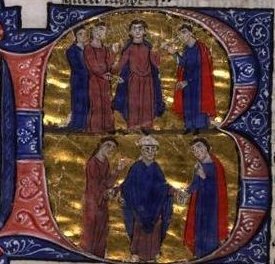 Guy was deposed as regent in 1183 and Sybil’s son crowned as co-king Baldwin V. This way the throne would have been inherited by his nephew instead than by Sibyl and Guy. Baldwin IV also tried to have her sister’s marriage annulled but without luck. In 1185, Baldwin IV died. He was followed in the grave by his nephew the following year. Sibyl was now Queen. Court members decided that they didn’t want Guy to be their King so Isabella promised to have her marriage annulled as long as she was allowed to choose her next husband. Everyone agreed to this plan. The marriage was annulled and Sybil was crowned and outwitting the High Council, chose Guy as her new husband. The two were quickly remarried and Guy was crowned King. This was a smart move for Sibyl but bad for the Kingdom. In 1187, just a year after their coronation, Saladin’s armies invaded the Kingdom of Jerusalem. Guy and Raymond were unable to cooperate and so Saladin won the Battle of Hattin. From there, he advanced to Jerusalem. Sibyl helped defend the city but to no avail. Jerusalem was conquered but Sybil and her daughters managed to escape. Soon Guy joined them. Guy then participated at the Third Crusade, besieging the town of Acre for two years. While there, an epidemic swept through the military camp, killing Sibyl and her two daughters. It was the year 1190. Her successor was her half-sister Isabella, but for two years, until a general election was held, Guy refused to pass the crown to her.